Its been a long time, and that’s a good thing, I guess. I begin writing this from the darkness of my bed at Grizzly House on the St. Jude campus. The room is dark with the exception of residual light from my laptop monitor, concentrating its dull glow on me as Brennan sleeps soundly in the adjacent bed. It is our last night here from a fairly rigorous week of examinations, scans, screenings, samplings and reunion, as Brennan undergoes the most thorough check-up of his remission. It is now well past the middle of night. My mind is racing, so I write. Its is the second anniversary of transplant number 4. Having been at St. Jude so frequently since that date, the time in between is difficult to appreciate. Of course, the first year post-transplant was primarily spent here, both in-patient, and on an out patient/clinical basis, as Brennan’s little body adjusted to what we pray to be a functional, and therefore his last, immune system and the collateral issues associated with allogenic bone marrow transplantation, primarily graph versus host disease. And even since the first anniversary, we have had clinic visits to St. Jude monthly. Just this past spring he started eating solid food again without the assistance of a gastric feeding tube and pump. And since that time, it seems like every month he has been evolving more and more into what appears to be a normal little boy. And this week, we are close to what appears to be strong confirmation that his leukemia remission is strong and that his fourth immune system is working as his his first was intended. I realize a lot of time has passed since providing an update, and do not use these words carelessly. This past year has been very long and, while we are home and getting back on track, we have all be very mindful of the fragility of it all through the ongoing struggle against chronic graph versus host disease (CGVHD), diagnosed two Thanksgivings ago. But with careful management of this potentially lethal side effect of bone marrow transplantation, it appears that the vigilant efforts of his medical team to more slowly and deliberately wean his immune system to its new host are being realized with, what around here has been received as miraculous. This trip is meaningful to our family in so many ways. As a benchmark for the miracle before us, we breath easier these days, tending as much towards weaning Brennan back to life as a school boy, trying to catch him up with his peer group at school and watch in joyful tears as he tries to keep up with the other kids on the basketball court. Step by step, one day at a time, he continues to improve. He goes to school. He wants to be on the team. He is a kid. And with Tara and the brothers all together here, this trip serves as a pilgrimage of sorts, where and when we all honor this place and its people which collectively represent so many strong ties to the most life changing experience imaginable. The boys and Tara are asleep at the home of our friend’s the Lackies, who just three years ago were total strangers. Brennan has stayed close to campus at night because his mornings start very early, and requiring anesthesia for some of his procedures, it is good to have a bed close by. But while apart at nighttime, we’ve all five been quietly, respectfully and simply here. We did not call a lot of folks in Memphis, or arrange a big celebratory social schedule, quiet frankly because we feel like this trip is so important that we need to focus our intentions on what it all means. During the day, the brothers have been able to do so with the gracious and always welcoming community of the little Montessori school they attended here for two years. As always, they are welcomed as family, tending to their own studies from home as their peer group goes about their day. To the extent that any celebrating has been achieved, it has all been done in or around St. Jude. Dr.’s, nurses, clinicians and even maintenance and security workers who recognize Brennan as he walks through the halls, offer hugs and smiles. And, outside of campus Wednesday night, we toasted our old friend and compadre of the boys, Cameron Varnell, who just completed radiation therapy for the recurrence of AML in the form of a tumor that was detected in early December. Cameron has been here since we started. He has been through a lot, and it seems like we’ve most always managed to experienced a lot of it with him. But it was good breaking bread with this fellow warrior, for whom we continue to pray along with many others who still finds themselves in the fight. And of course, the absence of many remains most conspicuous. Walking into the hospital Wednesday, one of the BMT pharmacists, who had been a great friend and joke teller with Brennan, told me, “Things are ok but hard. We get a lot of bad news, but thank God for the good news we get every now and then.” Patient artwork in the halls reveals prayers for healing and reconciliation from wonderful children we know who are no longer here. But every now and then, we run across a parent or child for whom we have maintained nervous hope and expectation. One of our dear friend’s daughter has been truly living hour-to-hour in ICU for over a month, but Thursday her mom appeared in the cafeteria, smiling and hugging us with reassurance that they actually are soon to be out of ICU and back in the fight. And another young boy, who was down to the last minute in obtaining a bone marrow donor last fall and for whom I had been very worried, revealed his still living and fighting presence as we said our goodbyes to the transplant clinic team on our last day. I was afraid that I would never see him again. The last day of clinic work was yesterday, and Today, as I finish this entry, I am happy to report that Brennan’s results were so strong that his next visit is not until June, four months from now and representing the longest span between appointments since this all started. He will remain on the daily chemo medication, as an immune suppressant that keeps his CGHVD in check, and will continue to have his monthly phlebotomy procedures at the CMC at home to relieve the iron overload reveled in his bloodwork. Despite this, though, it looks like the groove of normal life will continue to widen its channel, allowing Brennan to be a semi-normal kid. There is a lot of hard work ahead for him, catching up with his peer group, having effectively missed the first four years of primary school. But that’s a good problem. So as we make the long drive home, our load is lighter. The substantiation of this miracle intensifies our focus on the road ahead. And as Tara and I sit side-by-side, listening to our own music, with three boys in the back seat who’s love for each other has been perpetually galvanized through trial, our emotions are bubbling with a mixture of gratitude, regret and hope. We are grateful, of course, to God for the miracle before us; but also for this new extended family that has been firmly engendered through pediatric cancer. We have regret, and questions that we are not qualified to answer, for so many wonderful kids who have not, and will not make it. Why them and not Brennan? Why their family? Why? I guess we must simply embrace their memory with the same gratitude we have for Brennan, thereby offering thanks for the miracle of their lives and the silent contributions they continue to offer this world. And then there is hope. There is the hope that Brennan offers for others, who continue to testify that their own fight is bolstered through his example. And their is hope for the eventual CURE, and for which we now dedicate the larger portion of our non-professional lives. For this we Press On, both through our love for these kids and the Press On Fund, which has truly established itself as a contributing force and is making a difference. It may indeed prove to make a difference for Brennan some day or for someone else we know, in the event that cancer reenters our lives. But as testified this past January on Patrick Chance’s birthday, kids around the country are still alive because of one child’s legacy. And there are also kids alive because of Brennan and because, regardless of our plight and circumstances, we recognize that everything and everyone makes a difference. Absolutely, the most significant factor that is elaborate while purchasing medicaments from the Web is to make a best choice. To purchase medicaments online from a privileged web-site is safe. Other medicaments are used to treat complaints such as hair loss. What about buy propecia online and alopecia? Very likely every adult has heard about buy propecia. (Read more finasteride online). A extended medical state present is hair loss. What physic does treat alopecia? Most of patients using this physic mostly do not have any side effects to Finasteride. Even if this preparation is not for use in women, it is not known whether this generic could damage a nursing baby. We love… and live for good news! Thank you for sharing your story and for encouraging everyone in their own walk of faith and journey through life. Thank you so much for the wonderful update, Turner. You all amaze and inspire us and of course we continue to hold your whole family close in our prayers. What a beautiful writing. You are truly Blessed. You have given incredible inspiration to us all. I am so happy for all of you. I cry each time I read one these eloquent entries. They have remained a vital part of my life. Brennan, your family and shared journey serve as the highest form of inspiration. Press on …..
Thankfully I have read your eloquent portrayal of another visit to miraculous St. Judes. What good news for Brennan and all of you. I remember when my oncologist changed my recheck visits to 6 months and then a year. I know the joy all of you feel. God bless all of the Simkins and especially Brennan. Way to go Brennan. You are one amazing guy! Always nice to get an update from you all. Your family has been and always will be an inspiration to me and many others. God bless the Simkins family and all the St. Jude families, past, present and future. We are so happy to hear the good news, please keep that type of news coming. We are Leslie Zacks parents and friends of your Grandparents. What a great post to find this afternoon!! Thank you for such a thoughtful update and congratulations on such wonderful news. Brenny, you da man! Love from our whole crew in Princeton. Press On!! So glad to read the good news. Love, and see you soon! Brennan is my inspiration– together with y’all, he makes everything seem possible!! So good to hear of Brennan’s news – thank you for sharing. Your posts continue to be inspiring to all of us. To our favorite adopted Memphians, you continue to inspire us and remain in our prayers. Press on! Turner, your writing about your family is inspirational. Thak you for sharing this part of your journey. So thankful for this wonderful news. Thank you for sharing your journey with us. Wonderful news! Great news! So happy to hear Brennan is doing well on this important second anniversary. Hope to see you all soon! Love to you all! Beautifully expressed. Our prayers are always with your family, for Brennan’s recovery and strength. I continue to pray for him everday. So happy to hear he is doing well. We love you Simkins’ family, and we are filled with awe and gratitude at Brennan’s recovery!! Brennan’s story has touch so many lives and I cannot wait to see the plans God has for this incredibly special boy- wow!! These two (God & Brennan) have a remarkable relationship. Thank you for sharing it. Wow … Brennan’s story is testament to never giving up is worth never giving up! Congratulations for good news of such a long duration! Your family’s story continues to be one of continuous hope, continuous prayer and continuous miracles. Godspeed to Brennan and all of you. We are so glad and thankful. Brennan is so courageous. Many thanks for the inspirational update and lovely photo–the picture is worth a thousand words! GREAT update! What an amazing warrior! So thoroughly delighted to hear the news! You ALL are an inspiration to the world and we appreciate your sharing your journey! May God continue to bless and guide your every step! What a wonderful report!! Brennan remains in my day prayers. Love to all! Bennan is my inspiration. That never give up fight that he shows all of us regardless of the odds is encouraging to say the least. My prayers and thoughts are with Bennan and the Simkins family. Thankful to be able to read this update and thankful to a loving Father who continues to use Brennan as a beacon of light and hope. Love and prayers provide, forgiving the losses heal. Faith through it all is miraculous!!! Love and prayers provide. Forgiving losses heals. Faith through it all is miraculous! Love and prayers provide. Forgiveness of losses heal. Faith through it all is miraculous! What wonderful, humble and uplifting words. My heart goes out to you all for the battle you are winning. I do hope we can catch a glimpse of you on our visit later this month. Sending you all love as always Charlotte, Rupe, Barnaby, Freddie, Josie and Amelia Hampel. p.s. 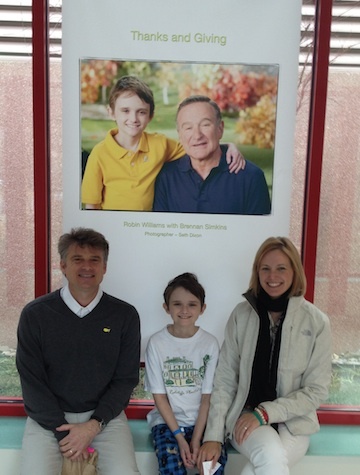 I am very impressed by photo showing Brennan with Robin Williams, my favourite actor/comedian! We are so happy for you all. God is so good!! So glad to read this positive report!!! God is great! Will continue to pray for Brennan to continue to improve and remain healthy. This is wonderful news! Turner, your posts always leave me feeling gratitude and hope, for your family, for mine, and for all children everywhere. Press on and on! So Glad to hear some great news about Brennan. It is also so exciting that this journey you have been on has lead you to co-create such a wonderful charity that is accomplishing so much in a short time frame! Congrats for the contribution “Press On” has funded for the Radiation Therapy Program at the Aflac Cancer Center in Atlanta. Brennan will always be a bright star and an example of hope for everyone who has ever read about his journey. God’s hand is seen in every aspect of the Simkins family. God Bless you all.